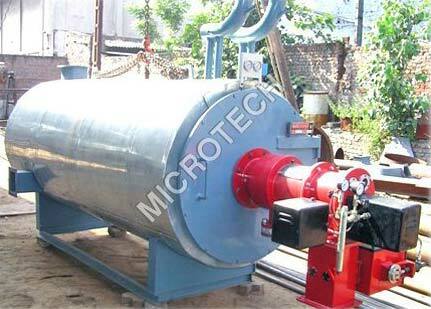 From Gujarat, India, we are making available 3 Pass Thermic Fluid Heaters that are widely used in chemical industries. The entire lot is designed and developed using premium quality raw material and modern manufacturing techniques. Fabricated as per the international standards, these heaters are highly efficient and cost effective. These heaters are available in solid fuel firing and gas firing versions to meet the distinct demands of our valued patrons. Interested buyers can get them in tailored specifications, from us. Low Thermic Fluid Flow Differential pressure switch (DPS) across inlet and outlet headers cuts of the ID Fan slowing down combustion. Thermic Fluid Temperature High Digital Temperature cuts of ID fan at set point. Coil Chocking Differential pressure Switch (DPS) across system cuts of the ID Fan Slowing down combustion. Thermic Fluid Motor Trip Electrical Interlock cuts of fans.